Crushed new potatoes with garlic and herbs make a wonderful side dish! These new potatoes are boiled until they’re soft and tender, then baked in the oven with all the seasonings until they’re crunchy and crispy from the outside, but still have very creamy centres. 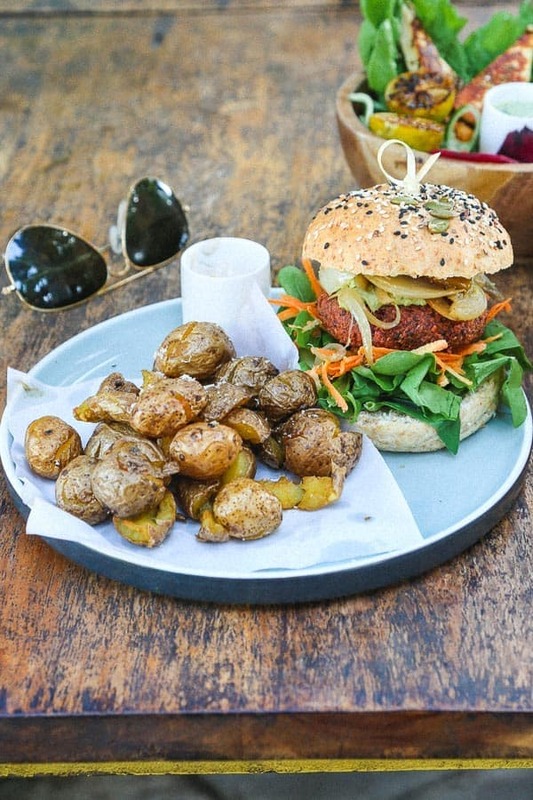 When we were in Bali earlier this year, we found this amazing vegetarian restaurant that served delicious burgers with crushed new potatoes. We only discovered the resraurant in the last 2 days of our trip, but I managed to visit twice to order these seriously good crushed potatoes! I learned how to make these crushed potatoes at home, and I became obsessed! They’re great when they’re served as a side dish, or just eaten on their own. And the best thing, is that you can get as creative as you like with all the seasonings, and toppings that you can add! The potatoes have a crispy texture from the outside as they’re baked to perfection, but the centres stay creamy and fluffy at the same time. They can be as flavourful as you like, so have them plain with just a pinch of salt and a grind of black pepper. Or top with crushed garlic, fresh or dried herbs, paprika, chilli, you name it! As these potatoes aren’t diced or anything, the best way to make sure that they’re cooked through and lightly crushed so that they stay in one piece, is to boil them before you crush them and bake them. You don’t need to peel them, just wash your potatoes, then cook in boiling water for 15 minutes. This will ensure that they’re soft but crispy. Think about how amazing these will turn out when they’re boiled, and then baked. Yum! Step 1. Boil slightly salted water, then throw your baby potatoes into the pot. Leave them to cook for 15 minutes or until they’re cooked through and soft. Step 2. Grease your baking sheet with olive oil, and get the potatoes out of the pot and onto your baking tray. Step 3. Lightly crush the potatoes with a fork or a potato masher, but make sure not to over do it as you don’t want really flat pieces of potato all over your baking sheet. Using the excess olive oil on the baking tray, lightly brush the potatoes with the oil. Step 4. Season with freshly ground black pepper, and sea salt. Step 5. Sprinkle with either dried or fresh herbs (I usually use thyme and basil, or rosemary). You could also add crushed garlic. Step 6. Bake in the oven for 10-15 more minutes at 200c. The baking time depends on the size of your potatoes, so keep checking on them as they bake. Serve immediately! These smashed new potatoes are best when they’re served hot. Leave the skin on! You don’t need to peel the skin, as the skin helps the potatoes give that lovely crunch. Also imagine how time consuming peeling a pound of small potatoes can be! Just wash the potatoes in water, and they’re ready to be cooked! Make sure not to overcook the potatoes when you boil them. They usually take 15 mintues until they become tender, but this also depends on the size and the type of the new potatoes that you’re cooking. Olive oil is the best oil that could be used to bake these potatoes. When the potatoes go into the oven, make sure that the oven is preheated. This will help you get that lovely crunch that you’re aiming for. WHAT SO SERVE SMASHED GARLIC POTATOES WITH? Do you own an air fryer? If you do, then you must try this air fryer chicken breast recipe! Perfect with the crushed potatoes, add your favourite sauce and enjoy! Serve these crushed potatoes with a quinoa bean burger, and mayonnaise. Or you could serve these potatoes in a bowl with a big salad, and veggie fritters. Try my corn fritters, they’re delish! These potato cakes are to die for! They’re made from mashed potatoes and they’re one of the most popular recipes on the blog! Cooking for a romantic dinner? Why not make those heart shaped roasted potatoes? If you like Middle Eastern flavours, these hot potatoes or Batata Harra are so easy to make. Love waffles? Try these super easy potato waffles! And for a main, try this vegetable potato bake it’s sooo good! If you make these crushed new potatoes, please don’t forget to rate this recipe and share a picture on social media. Tag #LittleSunnyKitchen in your posts as I would really love to see what you make! Thank you for supporting Little Sunny Kitchen, so I can keep sharing my tasty recipes with you for free. Crushed new potatoes with herbs make a wonderful side dish. They're boiled until they're soft and tender, then baked in the oven with all the seasonings until they're crunchy and crispy from the outside, but still have very creamy centres. Boil slightly salted water, then throw your baby potatoes into the pot. Leave them to cook for 15 minutes or until they're cooked through and soft. Grease your baking tray with olive oil, and get the potatoes out of the pot and onto the baking tray. Lightly crush the potatoes with a fork or a potato masher, but make sure not to over do it as you don't want really flat pieces of potato all over your baking sheet. Using the excess olive oil on the baking tray, light brush the potatoes with the olive oil. Season with freshly ground black pepper, and sea salt. Sprinkle with either dried or fresh herbs and garlic. Bake in the oven for 10-15 more minutes at 200c. The baking time depends on the size of your potatoes, so keep checking on them as they bake.